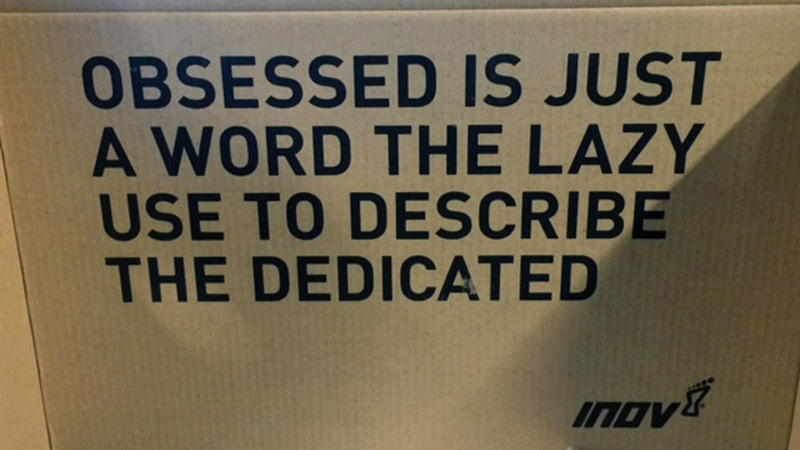 What you see when you open up an Inov8 shoe box. Great motivation & great shoes. The 2015 Bootcamp Challenge is a month away. I could do it today. I am ready to devour those obstacles & pumped to put my body to the test to see how the training has paid off this time. But there is more work I need to do. Timed stair sprints incorporated with good-mornings with sandbag, bear crawls down stairs, clapping pushups and whatever else I want to do. Things will change in September. Among other things I will stop running on the trails and focus on timing my true 3 miles on the road. I want to know what my pace feels like on flat ground for 3 miles and see what my time is. Also, the long run will be decreased after a 9 mile run. Aside from conditioning for this race I want to make sure I have a good amount of miles under my belt. The reason being is after this race I am on a good track for my race in San Francisco which is an 11 mile ocr. It is in November (Men’s Health Urbanathalon). Last time after Bootcamp Challenge I was adding a mile on every week onto my long runs to get ready for November. It worked out fine, I felt good in the race, but I don’t want to push it like that again. I got a barrel roller (Skilz) over the weekend and I have been getting up close & personal with it this week. I know I am late to the party on this one but I am glad that I arrived. I was able to address the tightness in my lower calves & do some more thorough pre & post workout warmup/stretching rolling out things. I like the firmness of this (vs a softer foam roller). Ahhhhh…it may hurt a bit but the end result feels awesome. After a day or two of getting my lower calves loosened up it paid off. My 3 or so miler on the trails was back up to tying my fastest time. Next week it will only get better. I had to scour youtube for just a bit to find a way to use it so I could put more pressure on my calves than just rolling on top of it. Below is the link to the video. Check out the part where he uses the foam roller. Well hopefully there are “hearers” out there. 🙂 But I was thinking about this a couple days ago…why I love cooking. For me it goes back to my childhood. Both of my parents are great cooks. Growing up- for birthdays & other special days the question was “what do you want?”…not Where do you want to go out to eat? Going out is reserved for when the house is tired or whatnot. I pretty much follow the same practice. 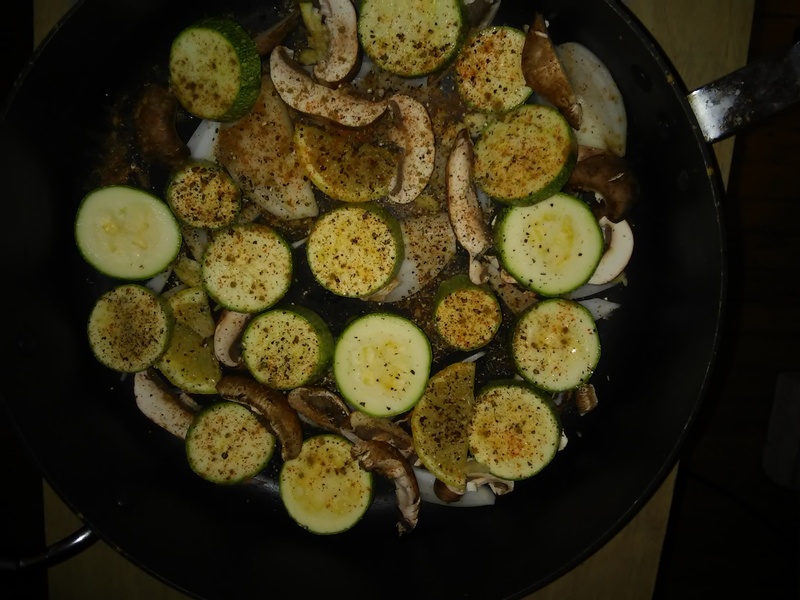 So I was lucky being immersed in foods cooked/baked/made from scratch, loving veggies (almost all, yes mom & dad sweet potatoes are NOT on that love list) & other amazing meals they would and still do. Cooking itself for me is relaxing 98.9% of the time. It’s creative. It’s rewarding. It’s self sufficient. After you are comfortable you stop scouring cook books, making sure the measurements are right (unless ur baking) & letting go a bit of perfection it is fun. Or you get a couple recipes & mix and match what you like about them. Hanging out with a good friend or friends while doing it makes it even better. But end of the day if you cook you know what is going into your food. You understand how preparation can help. It could be complicated. It could be simple. But you know the ingredients. You know if there is butter, coconut oil, or the worst crisco known to man in your meal. For me a sign of care, friendship, love or whatever for another person is cooking for that person or persons. Of course the ranges of “just cooking” to “throwing down” should be kept in mind if you are wooing them or just cooking, :). Its all relative though. Effort is effort. Anyone invited to the dinner etc party should realize that! Okay today is my rest day & not-on-computer-day. Its Netflix time. Ciao! Okay, so pretty dramatic title – but still. At this point things are ramping up in my training schedule since the race is in late September. For instance: reps have increased, hill sprints & fartleks are on the menu, I am timing some exercises now to increase intensity, I am only using the #60 sandbag & I need to must beat my long and short runs each week by at least 5 seconds… the last one is the rub. Last week was my 2nd week of things ramping up. My short run – a bit over 3 miles on hilly trails was not good. My time was about 20 seconds SLOWER than my fastest time. Frustrating. Very. I did some extra sandbag exercises after as punishment. I don’t get runners high (at least I don’t think I do). But a good time always makes the day awesome, and not reaching my goals…. well. Who the hell broke this? Oh yeah, me. 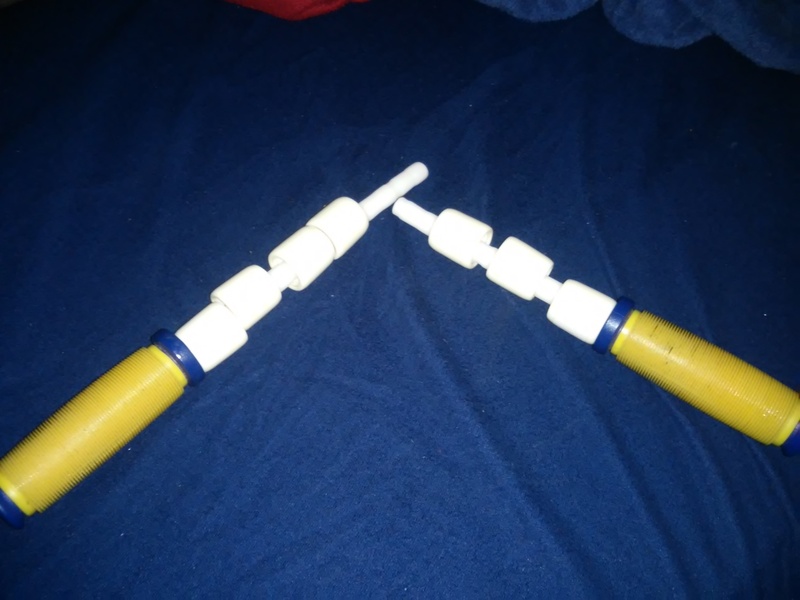 My trusty stick was used to roll out my legs and other tight parts before & after a workout. Perfect timing when I am a bit sore than usual I break it while rolling my leg. At least it died doing what it was meant to do. A friend gave me a lacrosse ball. Which was a nice replacement to an old tennis ball to grind out tense traps and such on the floor. I’ve been pretty creative with it but I need something better. 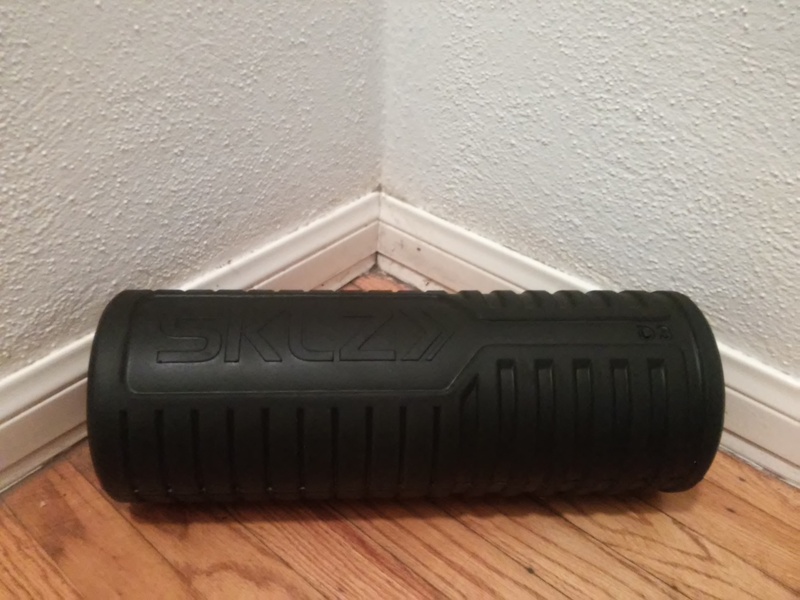 Another friend is planning to hook me up with a good foam roller soon. Until then gotta keep being creative & stretch. So perspective. For some silly reason I thought when I ramped things up it would be seamless transition with no more fatigue than usual. Yep, silly. Also only the short run time has dropped. I’m shaving seconds off my longer run every week – which for the time being is 8 miles. In addition- the other days are going as planned. So I just have to stick to my motto – train hard, train smart. The last thing I want to be on the injured list. Been there, done that. This is something I make at least 2-3 times a week. There is probably some recipe out there probably similar with a more sophisticated name…but at least you know what this is by the title right? 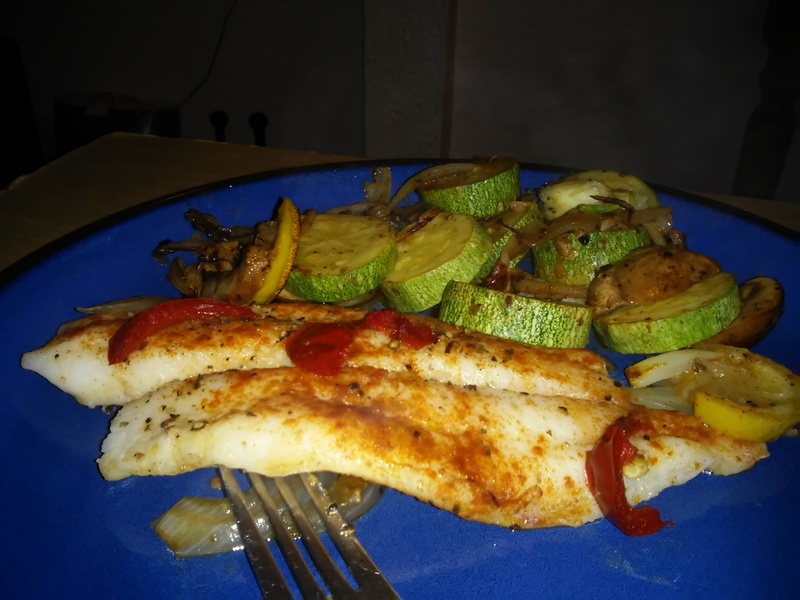 This time I did onions, garlic, mushrooms, veg I got from the farmers market, peppercorns (to crack), cumin, paprika & coconut oil…and fish (a mild flavored white fish). What I did this week. 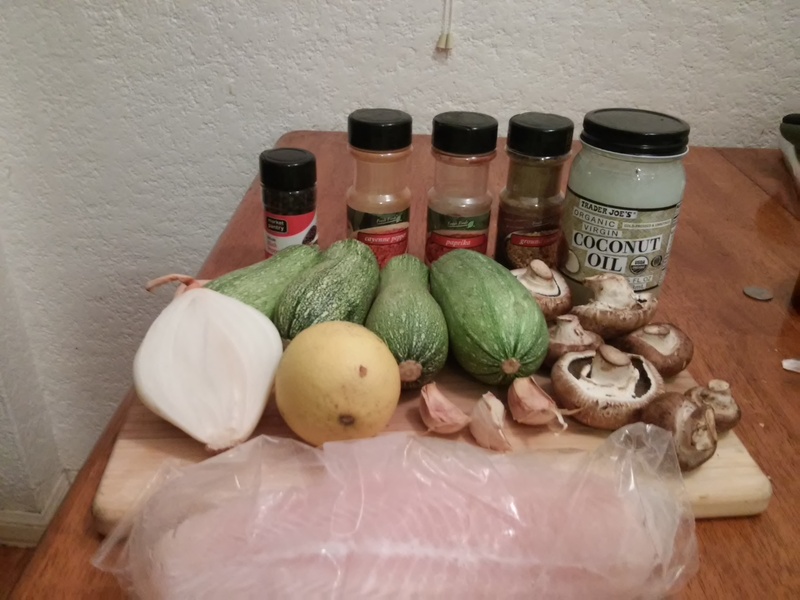 The fish, coconut oil, garlic & onions are staples…the rest depends on what I have in the fridge. Slice up all of the veggies but not too thin. You don’t want them to get too soft/overcooked. Slice up the lemon, no squeezing necessary. Cut up the onions as fine as you want. I prefer large chunks so I don’t chop them up. Then place them in your pan & pour/scoop some coconut oil in the pan. Id say 2-3 tablespoons or so. Sprinkle the pepper, cumin etc… If you have fresh rosemary, basil, sage etc, it is great also throw in whole. Ready to top with the fish! Now one more step – the fish. It can be frozen or thawed. I have had success either way. If it is frozen just add a couple more minutes to cooking time. Ready to cook…dinner in T-minus 8 minutes. 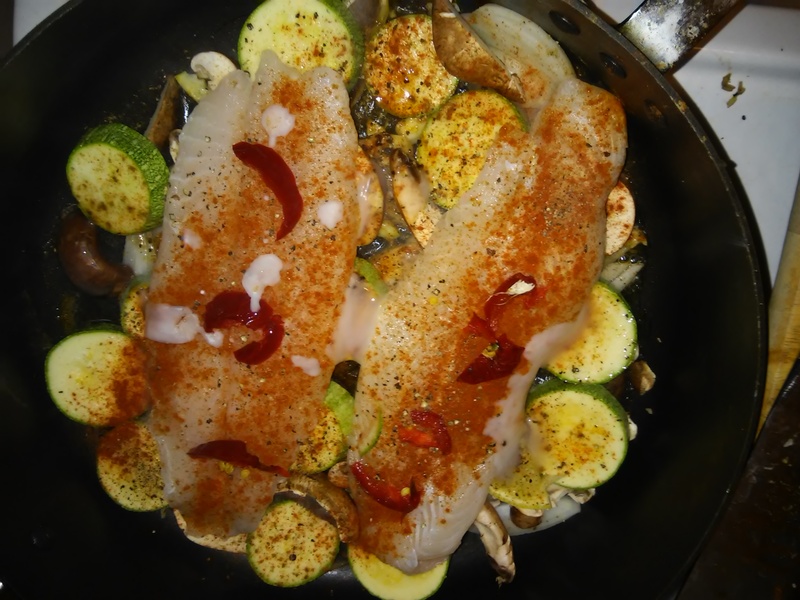 Put whatever seasonings you see fit on top of the fish. I put paprika & dug out a cherry bomb pepper (yes its hot) out of the freezer & put some pieces on top. No need for much salt with that “heat.” So you can use cayenne pepper if you don’t have any fresh hot peppers lying around. Feel free to put the lemon on top of the fish but I like it underneath so it cooks with the veggies and the juice stays below and also boils up into the fish too. Put on medium heat, have the top fully on the pan. 8 minutes cooking time. Add additional minutes if the fish is frozen. Once the fish is cooked, the veggies will be done! A healthy & lazy dinner is served. I was going to talk about another race or studying for my ACE certification but instead a short one today about goals. For me working out or specifically training for an event is about setting goals for myself. Larger goals -> finish in a certain place or make it through the event. I often forget leading up to it there are equally if not more important smaller goals of sticking to my workout schedule, making sure I take care of any tightness in my body or allowing myself to recognize how far I have come. Incremental progress no matter if it is a couple of seconds, an extra pull-up or a more fluid bear crawl exercise will add up to a better event for me. Easier said than done to allow myself to recognize this, haha. The rest of the day not working out regardless how it goes is better after that workout and achieving one or many goals. Next week, hill sprints begin. Goal set. Such a love/hate relationship with those. 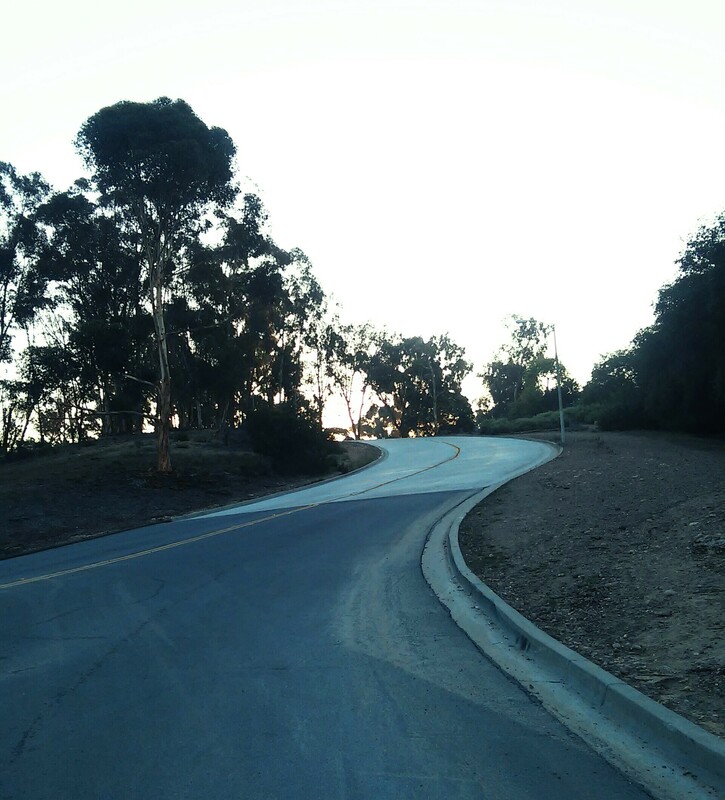 Hello hill….Sprint, breathe, walk, repeat. Another event (not a race) I have done and will do again is Goruck Challege. It is a 10-12 hour-long endurance event. Hold on, don’t stop reading. You can do this too. I was searching for something different than an ocr…something that would really take me outside of my comfort zone. Something that was not competitive but difficult. I saw Goruck Challenge before surfing online but just discounted it as lone of those oh-I-can’t-do-that events. Now I do it once a year. I have done it twice so far. It’s the first event I will do each year to kick things off. I see it has my hardest event of the year. Pretty much every other event I do is downhill as far as I am concerned. The races are not the same beast as Goruck Challenge. The first time I did it was on my birthday..definitely a memorable one! This is a team event. Let me repeat, this is a team event. It is not about how strong you think you are, how fast or fit you may think you are. Leave your ego at home. Instead it is about how strong the team is and how quickly the men and women can work together to accomplish whatever they are instructed to do. Both times I have done it has an awesome and amazing group of individuals who came together & worked together as a team. Especially my first time I owe it to my teammates that lifted me up and encouraged me to push through my wall and I am so glad I did. Both times was a different experience. Both times I finished it exhausted, excited and knew I would do it again. Before my first experience began. 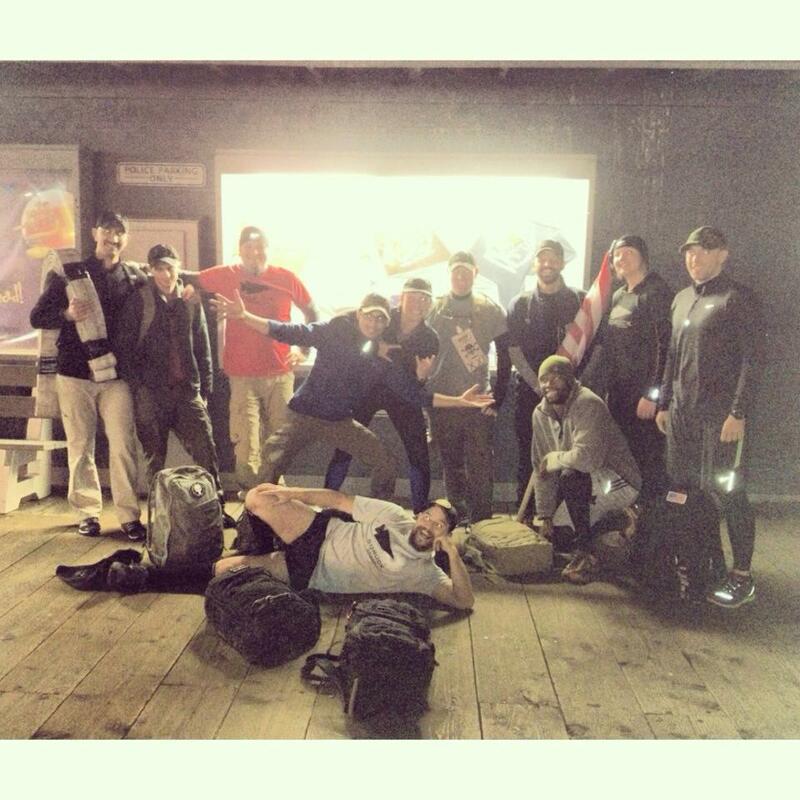 I was so lucky to be in this group of mostly veterans of Goruck events. 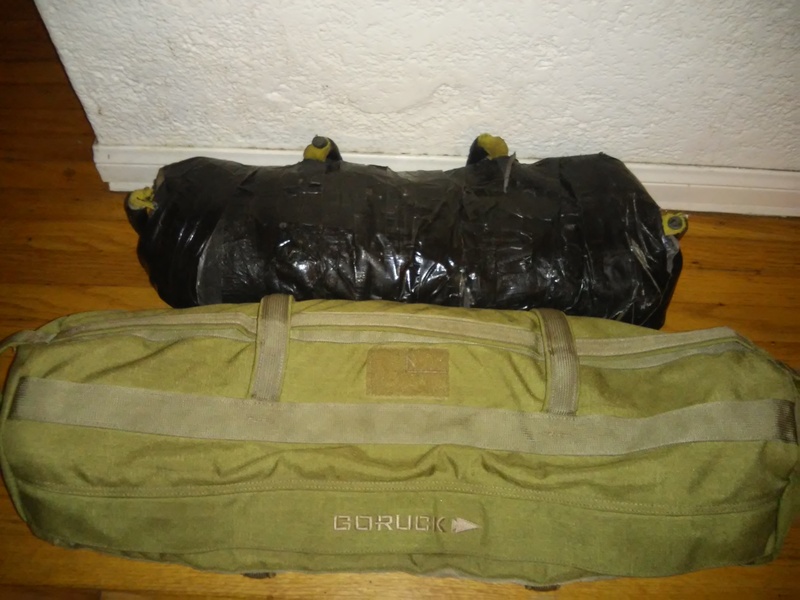 Lastly there are many useful blogs and websites that have specific suggestions for what to bring or wear to a Goruck event. Do your research. I don’t really think I need to be another voice to add to that. My main suggestion is to pack light & don’t bring anything you really don’t need. Fight that urge to bring everything you possibly can. After your first time you will understand what I mean. Keep in mind chances are strong that someone else may be carrying your bag at some point. Sharing my stories about doing it would not really do it justice. If the video gets you pumped, and you want to do something different sign up! There is a shorter event called Goruck Light, so if you want to experience a Goruck event that is not as long check that one out too. Just do your research, look at what is mandatory to bring. Look at what is suggested that you bring. Don’t come unprepared. Don’t be that person. At least once a week I think about Goruck Challenge. That is how much it affected me. Period. At some point in my life working out was not enough. Running was great, with a mixture of pushups and other outdoor activities like pull-ups. I was motivated but something was missing. Something to work towards, something to train for, a test to see if my training paid off. Although I do enjoy running – a 5K or ½ marathon is not my cup of tea. I have respect for those that do it but I was not excited at the prospect of just doing that. 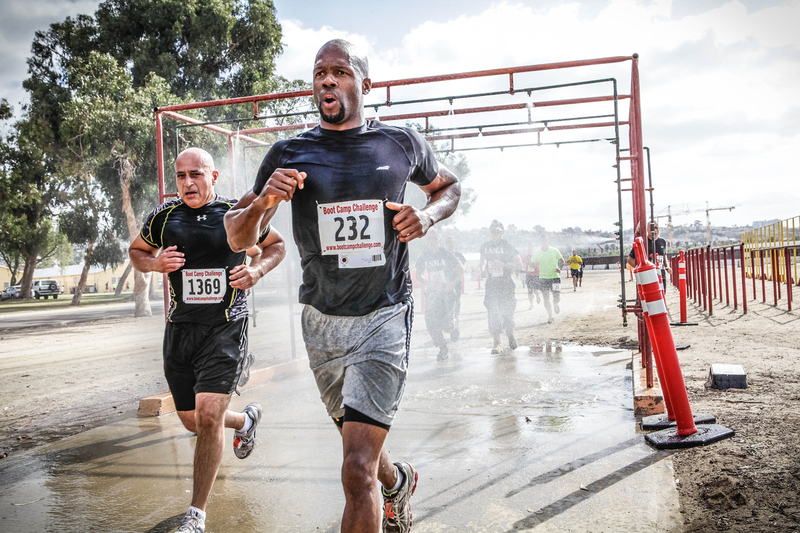 Soo a couple years ago I discovered what so many already knew about – obstacle course races (OCR). My first race was as a team was the Bootcamp Challenge in San Diego. How did it go? I did some trail running, and threw in some pushups and pullups. Not the best preparation. But I was really into it & so it began. But now I do it solo. I did it again, and again, and will be doing it again this September. My training process has gotten alot better since the first time. This year it’s personal. Why? Well…Okay, let me back up. I set the goal each time doing it solo to be in the top ten of my age group. I was close (11th place), hovered just in the 10 spot then last year 7th. I was great but I wanted more. I wanted to be in the top 3, get on the podium and get a medal. My training has evolved to a more focused progression of specific movements helpful in an OCR, endurance, strength and agility. Running a fast 3 miles or whatever length is not good enough. The obstacles can leave a participant winded and possibly injured if they underestimate (or don’t do their homework on) the obstacles. Without going meticulously over the training schedule it includes: stair sprints, bear crawls on grass, bear crawls down stairs, pull ups, high knees, timed 3mi trail runs, and timed long 7+ mile road runs. My favorite toy/cause of delicious soreness and sweat are sandbag workouts. I was playing with a 40 pounder (Skilz sandbag) for a long time. These days even after getting it replaced due to rips way to early, it developed tears again. Nothing is more annoying a distracting than doing movements with a leaking sandbag….especially at home. Enter duckt tape. Alot of tape, it has about a roll and half. But it does not leak. Its pretty unforgiving and firm. I got used to it. Old sandbag on the block…meet the new kid. I think you can tell which one is the new guy. I finally graduated to a Goruck 60 pounder after they were back in stock. I was super excited to get it. It’s interesting doing things like squats and turkish getups with such a heavier, softer and bigger sandbag. At least for me I feel as if I have to focus even more on my form with a heaver one. Okay, so why is it personal this time around? I know I can get in the top three, that’s what I want. I possibly could have last time but here are the mistakes I made. #1. I didn’t start at the front. Some races – obstacles or otherwise have staggered starts so everyone does not start at the same time. The Bootcamp Challenge does not. Thus far the only divisions are elite group, teams, individual men and individual women. So regardless how many there are in each group they all start together. I am not complaining, its just a fact. I knew that and I could have saved time starting at the front so I didn’t have to get around other people. So suggestion – to someone that is doing a race and wants to really compete…don’t be shy if there are not staggered starts. Make your way (nicely) to the front before the gun goes off. #2. I didn’t wear a watch. Obviously being fast and getting over the obstacles is key but perhaps I thought I was grinding out a good time and I felt like I finished strong and passed alot of people. BUT just like when I am timing my runs these days that time can motivate me to push myself more to achieve that goal. For sure I won’t forget my watch this time. BTW any water resistant watch will do. Mine is a cheapest Timex I could find and it works just fine for my timing needs. I can spend that money elsewhere on my fitness gear. #3. I did not taper right. Tapering is essentially reducing the amount of exercise before a race. Perhaps in time I can give some solid advice about this. I am still learning myself how to do this right, re-reading resources about it and looking at my schedule two weeks out of the race and figuring out how to do this right. Stay tuned! If this happens then I plan to move on to all 3 Spartan races next year.